Millennial Maven | The greatest WordPress.com site in all the land! Happy sort-of-kind-of spring! I can’t speak for everyone, but here in the midwest we are still waiting for winter to realize it has overstayed its welcome and quickly yet sheepishly go away. Preheat oven to 350º and butter a 9 inch springform pan liberally. Dust the pan with flour to ensure that the cake does not stick. In a large bowl, beat butter and sugar until light and fluffy. This will take a while (5 minutes or so) and it is probably worth getting out the stand mixer. Add eggs, vanilla and milk. Mix in lemon and orange zest. With the mixer on a low setting, add flour mixture and mix just until combined. Stir in blueberries. Pour the batter into the buttered pan. Mix the crumb toppings together in a small bowl until it has the texture of sand with larger clumps. Sprinkle the topping evenly on the cake. Bake at 350º for 55 minutes or until a toothpick inserted into the center comes out clean. Allow the cake to completely cool before running a knife around the sides of the pan to ensure it doesn’t stick and then remove the outer ring of the pan. To make the icing, mix the lemon juice and powdered sugar together with a whisk until you have a smooth consistency. If the mixture seems to thick, add more lemon juice. Conversely, if it is too thin, add more powdered sugar. Drizzle the icing on the cooled cake. Enjoy! Note- this cake is great to make the day before. You can bake it off and cover it in plastic wrap at room temperature overnight. Just wait to make and drizzle the icing until the day you are going to serve. You should be using ACHVR! I feel like everywhere I look I keep seeing articles about this website ACHVR. I decided to check it out and had to share what I discovered. The temperatures are dropping quickly and all of the sudden, my feet are constantly cold. It is soup weather. It is also football weather. When those two things collide, buffalo chicken soup is born. We like things hot in this house so both cayenne and hot sauce are included. Change the amounts to make it right for you. No need to blow out your tastebuds. This recipe makes a large amount of soup that will serve 4-6 people, provide leftovers for a couple, or give the chef a weeks worth of lunch. Just like all soups and stews, this tastes even better the second day! In a large, heavy pot combine the cauliflower and chicken stock. Add the cube of bouillon once the water is simmering. In another pan, sauté the onion in the butter. When the vegetables are soft, melt the cream cheese, cheddar cheese, and half and half. Whisk until all of the dairy ingredients have melted. Add the hot sauce. Once the cauliflower is tender, blend the cauliflower until smooth. You can use either an immersion blender or a traditional blender in batches. Stir the diced chicken and cheese mixture into the cauliflower puree. Warm through. 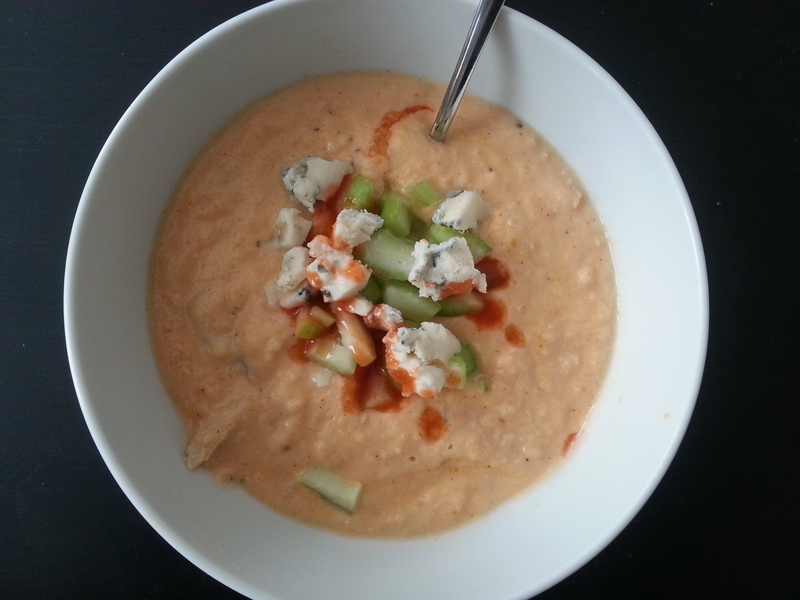 When you are ready to serve the soup, crumble the blue cheese and diced celery over the top. Drizzle with more hot sauce if you would like. Enjoy! Friday night and I am in the mood for something a bit indulgent. Having spent the past 10 years in Boston, I am very partial to seafood. After a little deliberation, crab cakes it is! This is a recipe open to interpretation. If you like red pepper or celery in your crab cakes, feel free. If you want to swap out the Essence of Emeril with Old Bay, do it up. Just make sure you have a glass of champagne or two….or three. This is a vital step. OR, you could just have the champagne and tell people you made crab cakes. It all works. Wink. In a large mixing bowl, pick over the crab to make sure there are no shells. Then, add the mayo, mustard, hot sauce, worcestershire, chives, Essence of Emeril, and remaining panko. Try the mixture and add salt and pepper to taste. Add the egg to the mixture and incorporate. Make 6 equal sized cakes out of the mixture. Coat each cake with panko. Place the cakes on a baking sheet and place in the refrigerator for about an hour. In a large skillet, heat 3 tablespoons of olive oil over a medium flame. When the oil is hot cook the cakes for 2-3 minutes a side or until golden brown. Whisk the mayonnaise, sriracha, and lemon juice until smooth. Plate the crab cakes and drizzle with remoulade. I chose to serve this with sliced tomatoes, generously seasoned with salt and pepper, and a little basil from my garden. It is a weird time in life when you find yourself saying things like “my garden” without a hint of sarcasm. Anyway, a light salad with a lemon vinaigrette would also be delicious. If you are feeling really scandalous, serve these with Old Bay sprinkled french fries. The first entry of a blog is a pressure filled situation. Lucky for me, no one reads it yet so there isn’t too much reason for worry. For my very first entry, I will share the recipe for something that has come to be known as “Pasta a la Steve.” It is one of the things I made for my husband early on in our relationship so it has the distinction of being named after him. It is easy, cheap, kinda-sorta healthy, and always gets a rave. Serves 4. Remove the casings from the sausages and place in the pan. Break apart the links. Cook until no longer pink. Remove the sausage from the pan and place on a plate. Set aside. If there are little bits of sausage stuck to the pan, pour a bit (¼ of a cup or so) of wine and scrape with a wooden spoon). In the same pan, add the olive oil. Wait about 20-30 seconds or until the oil spits when hit with a little sprinkle of water. Add the zucchini, red pepper, and yellow onion. Cook these veggies until almost soft. Add the garlic and red pepper flakes and cook for another 2 minutes. Season the veggies with salt and black pepper to taste. You are going to season each layer to ensure good flavor throughout the dish. If you just add salt at the end, it will not enhance the flavor of the ingredients but instead just leave the dish with a salty taste. Add tomatoes and lower heat to medium low. Cook for 20 minutes. When the sauce or until sauce has thickened a bit. In the meantime, fill a large pot with water. Bring to a boil. Before adding the pasta, add lots of salt to the water. It should be “as salty as the Mediterranean.” Add pasta. Follow cooking instructions on package. Add sausage and pasta to the sauce. Remove from heat. Stir in cream, cheese, and basil. *This recipe provides the opportunity to use any veggie in the fridge. If you have more peppers and no zucchini, just use the peppers. If you have some spinach you need to use, wilt it down in the sauce. Get creative!